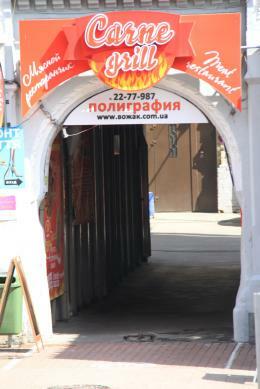 CARNE GRILL is meat restaurant located in the historical center of Kiev, Besarabka district, Street Basseinaya 5b (entrance through the arch). Cozy decor, upholstered furniture and friendly staff create an environment of home comfort. Peculiarities of cuisine are dishes cooked on the grill: classic American steaks, veal bones, kare lamb, Peking duck, salmon and trout. All dishes are well complemented by a wide selection of premium alcohol, draught beer and wine list.